When I reflect on my life, being a long time vegetarian is one thing that brings me great joy. Eating without eating any animals is such a simple choice, and it feels profoundly wholesome. It’s also fairly easy to do!! Making Dave’s Vegetarian Fried Rice. 1 package of Layona’s Vegetarian Tuna Chunks (other non-meat proteins can be used, but look up Layona’s and get it if you can. You won’t be disappointed). 4 eggs (haven’t tried egg substitutes, but I’m sure they’d work. Three eggs or two eggs works fine, too, if you’re watching that kind of thing). Cook the rice per the instructions. You’re going for non-sticky rice, so adjust as needed. Cook the quinoa. One cup quinoa and two cups water go into a small pot. Bring to a boil, then turn down to simmer. Cook 10 minutes. Remove from heat and let sit 10 minutes. 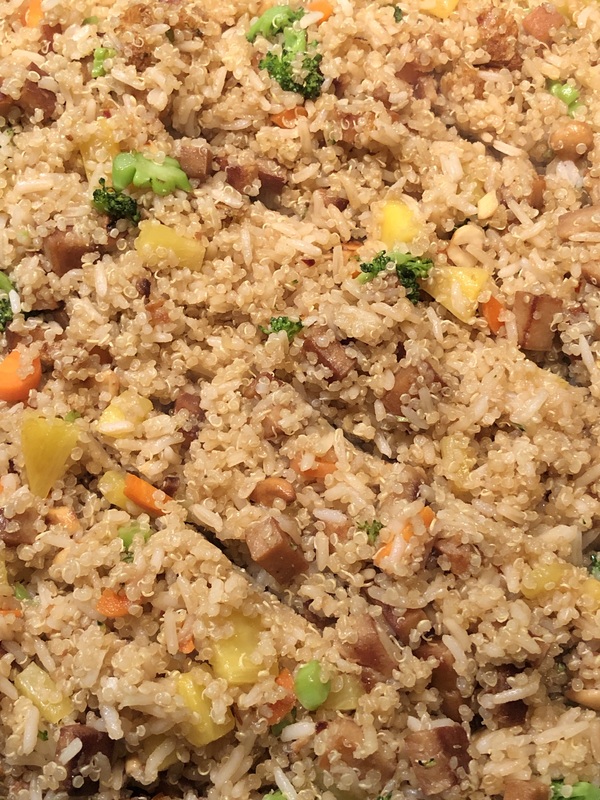 While the rice and quinoa cook, chop the pineapple, cashews, broccoli and carrots into pretty small pieces. I like everything that goes in to be the size of my pinky fingernail or so. No big bites, just evenly sized small bites. Chop the vegetarian Tuna Chunks into 1cm cubes (approximately). Make the Braggs ++ sauce: in a small bowl, combine the Braggs, Soy Sauce, Chili Oil, Toasted Sesame Oil, and Truffle Oil (optional, but super nice). Stir and set aside. In another small bowl, crack the eggs and beat lightly. Set aside. In a large pan (use your largest fry-pan or rice and veggies will be flying all over the place) add peanut oil and use a medium high heat. Add one piece of Tuna Chunk and wait till it sizzles just a bit. Add Tuna Chunks and cook until nicely browned on all sides; 4 -5 min. Add broccoli, and carrots and cook them for about 2 minutes, stirring occasionally. A lid will help steam the veggies between stirs. When the broccoli looks bright green, add the cashews and pineapple; 1 to 2 minutes. Now that everything is looking awesome, add the rice and add the quinoa. The pan will be full, but don’t make it so full that you can’t stir it. Flatten out the rice and quinoa on top and pour the Braggs++ sauce in a spiral around the rice and then mix immediately to spread the flavor. Chop up any clumps with the spatula. Mix mix mix. Let it sit. Mix mix mix. Let it sit. If any sticks to the bottom, use a hearty spatula to scrape it up.. that’s the crunchy goodness. Once the whole mixture is very hot, add the egg, again in a spiral over all the rice and immediately mix mix mix so that there are no big clumps of egg and it’s distributed very evenly. I like to use a mix/chop/scoop motion to really get it mixed well. The egg should be cooking with the hot rice. Make sure it’s all cooked. Boom. You’re done. Serve it hot with a crack of salt on it, maybe. So good. Let me know what you think in the comments!! Peace, my veggie loving friends!! !